In the wake of recent wildfires, there’s lots of talk about hardening the electric grid as a protective measure to make the system more resilient and less susceptible to future fires. But what, exactly, does “grid hardening” look like? 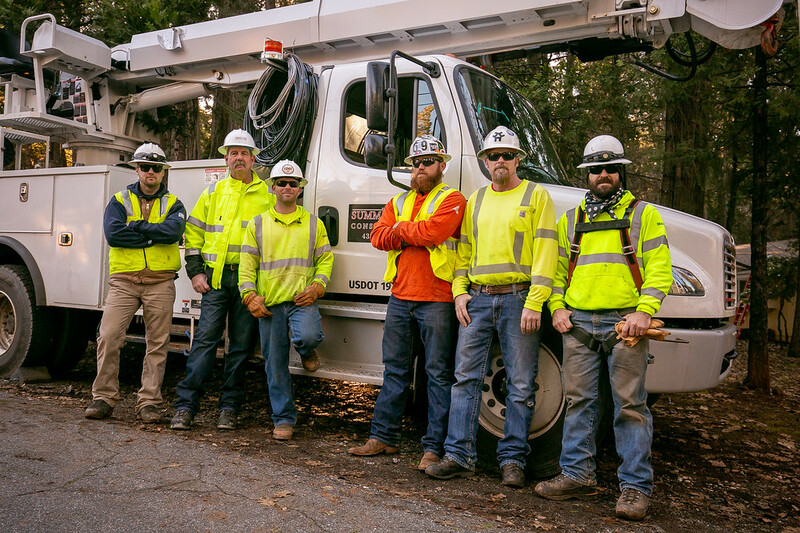 The Utility Reporter caught up with Outside Construction Journeyman Lineman and Crew Foreman Travis Citro and his crew at a grid-hardening project in Nevada City to get an up-close look at the work involved. Citro, who works for Summit Line Construction, has been assigned to a six-and-a-half-mile fire hardening project, which includes installing bigger and taller poles, new tree wire, new transformers that use non-burning oil which is better for the environment, and fire-resistant elf fuses and fault-tamer fuses. Travis Citro sends up tools to his crew. 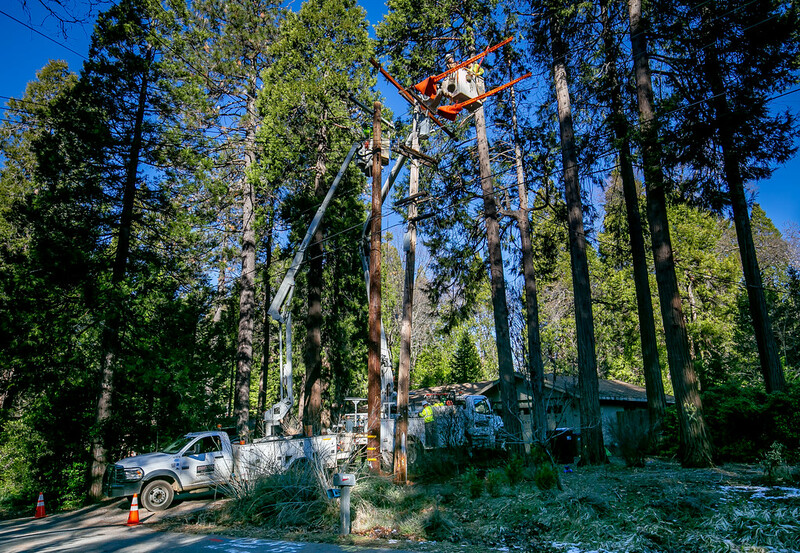 Dedicated IBEW crews – including Citro’s – are working to address PG&E’s new specifications for fire hardening, which includes installing new these new materials and implementing a new pole-setting depth chart. Previously, a 50-foot pole would be set ten percent deep plus a foot-and-a-half. Now, that same pole will be set ten percent deep plus three feet. Additionally, all bore holes on the bottom of a pole are now underneath ground level, which requires installation of a treatment pole wrap that was not previously done. 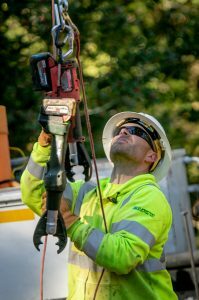 Citro’s project, like most of the current grid-hardening work, is situated in a heavily wooded area, so workers are minimizing exposed parts and conductors as much as possible to reduce fire danger. They are installing bird covers and covered jumpers, and anything that’s exposed is getting wrapped with a self-fusing tape for insulation. The upgrades are critically important work, but with so many new components, the crews must determine best practices for the new equipment specs – both the installation and maintenance. Many of these upgrades are industry-leading standards and require careful learning to address the differences and challenges these new processes create. 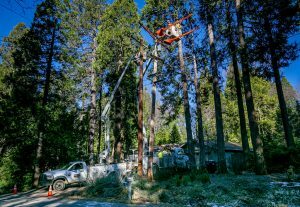 For example, Citro said one challenge his crew has had to tackle was discovering that after de-energizing the new tree wire, it still holds a capacitance charge on it, making it hot for a period of time. Linemen have to take that into consideration when testing and grounding. They are also learning how to manage new fully insulated wire, which is heavier and cannot support a ground on it. Now as much as ever, IBEW workers are building the grid of the future – one that is state-of-the-art, safe and reliable – and responsive to the energy, weather and capacity demands of the future. At the same time, these skilled members are committed to ensuring a smooth transition that has the least impact on customers and their service during the upgrades. Bronson Lee II, (above), and Louis Campbell install a transformer on a pole. Jake Jared guides a transformer up to Jim Taylor and Bronson Lee II. Bronson Lee II worsk in a bucket. Louis Campbell works on an arm. Jim Taylor, (right), and Bronson Lee II work in a bucket. Jim Taylor prepares a cutout for installation.